I have a little giveaway for you from Nasoya! Nasoya wants to help make tofu a little more 'friendly'. Knowing that there are people that would like to try tofu - but don't know what to do with it - Nasoya created their Tofu U site offering recipes, instructional videos, and even tofu games. This year, Nasoya Tofu U is challenging tofu eaters to convince their friends and family to eat tofu for a chance to win $1,000 through its Open Enrollment contest. Nasoya fans can enter their funniest tofu stories, photos or videos via Facebook or Twitter for a chance to win. 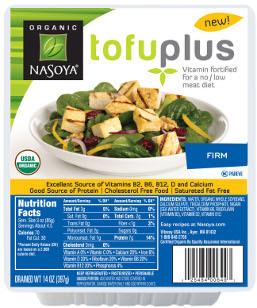 Nasoya has a line of tofu and soybean-based products, included their organic Sprouted Tofu with 12 grams of protein per serving, TofuPlus, organic tofu fortified with B2, B6, B12, D and Calcium. You can check out their products here (note that the won ton wraps and noodles are not vegan). Nasoya would like to give you a chance to try their tofu products, with 5 free product coupons, plus a Tofu U t-shirt*. All you have to do is comment here, on this post. One comment per person eligible. I will post the name of the winner tomorrow. *This giveaway is eligible to US residents only. I've been wanting to try this! I like quick and easy tofu recipes, like your lemon baked tofu from one of your cookbooks (might be Eat, Drink, and Be Vegan, but I have them all, so I'm not sure...). Over the years I've shortened it to mostly a bit of olive oil, some lemon juice, soy sauce, and Mrs. Dash! I'd love the tofu t-shirt and coupons! i usually get the whole foods brand. i would love to try this! My wife and I love tofu, especially Nasoya brand! I love Naysoya's tofu. Having a tofu u t-shirt would be awesome! I LOVE tofu! Dreena I really really LOVE your cookbooks! I've never heard of sprouted tofu. I'm so behind! Thank you for this giveaway! I love being vegan for 7 1/2 years!!!! Have learned to cook a lot of delicious meals!!! my favorite use for tofu is mayonaise that I make. It is better than any that I have ever tasted. My husband and I both love it. I also scramble tofu sometimes and make TVP from the water packed tofu. It makes really good sloppy joes, or put it in spaghtti or chili or vegetable beef soup. Healthy too!!! I love tofu! I hop I win !! I have been trying to use tofu more in my cooking. i LOVE tofu like i love peanut butter.. well maybe not that much, but it's in my top #10 favorite foods list! Sounds great! Thanks for the chance. Am excited to have been making tasty things with tofu lately-- makes me want to try more and more recipes! I love sprouted tofu because I am able to digest it easier than regular tofu. Thanks for hosting such a wonderful giveaway! Cool giveaway - thanks! I love the Sprouted Tofu; it has such a great texture and I love the idea that it's so super-high in protein. Roasted tofu with veggies is the perfect (and easy) Thanksgiving meal. My family loves tofu, and my 18 month old gets excited when she knows we're eating it for dinner, which warms my heart to know she loves such yummy, but good for you food. I love tofu! Thank you for the giveaway! I LOVE TOFU --- and eat about five packs of Nasoya a week! I marinate and bake tofu for hummus/veggie wraps, press it between fresh baked bread, add it to stir fries, lather it in barbecue sauce and grill it, scramble it with veggies and nutritional yeast, add it to chili and tacos, use it in soups, not to mention all the condiments it tofu allows me to veganize --- salad dressings, mayonnaise, and even cream cheese! or all the sweet treats i include tofu in... pies, icing, cheesecakes... the list goes on! i would LOVE to win five tubs of nasoya tofu this week, because, well... it would save me money and allow me to purchase more fresh, organic and local veggies for my belly! plus, i would love to rep my tofu love in a cute new tee!! I'd love to try their sprouted tofu! I would love to try this. Pick me! Please enter me in the giveaway! Thanks, Dreena. My first experience with tofu was my college roommate trying to convince me to eat healthier. Her idea of healthier was throwing unpressed, cubed tofu into her pre-packaged rice mixes (think Lipton, RiceaRoni, etc) and force feeding it to me. It was awful!!! I have since learned the error of her ways and love tofu pies, popcorn tofu, stir frys, curry, the list goes on. I'd love some free Nasoya to play with, too! I've never used tofu before this week. I made your Creamy Orange Poppyseed Dressing and had leftovers...what to do?? Thought about Alfredo Sauce (as I am trying to cut out most dairy), and then had some foods in my fridge I needed to use up so made some Sort of Scalloped Potatoes (my own recipe) using the soft tofu blended instead of cream/cream soup. Very tasty. I think I will buy it again! Between the dogs, my husband and myself, we go through a ton of tofu, so this would be great! I'd definitely be interested in trying a lot of the soft tofu recipes, because I'm always cautious when it comes to using tofu there. Once I have tried their light tofu, but not their sprouted! I'd really like to give it a shot. I've been curious about the sprouted tofu. I graduated from Tofu U! This is such a cool giveaway! I love nasoya tofu. I wish I had one of their tofu presses, too. My very picky children love a tofu recipe that I make. Go figure. . . I would love to win this - I've been wanting to try their sprouted tofu for a while now! Mmmm... I love Nasoya tofu! I like that they sell lite versions of their firm and silken tofu too! Plus, how can you beat fat-free Nayonaise? ohh, hoping it's not too late! I am so curious about sprouted tofu! Would love to try it! <3 tofu. I even eat it plain in salads! I'd love to try the sprouted version. I would like to get some Nasoya tofu! I haven't had Nasoya before. I've heard others talk about it yet for some reason I just haven't tried it. I love tofu yet I wonder if it taste different from the tofu I use now. Plus it's packed with lots of nutrients. I love that. I've been a little scared of working with tofu, so I would love to win this and be able to experiment. I love Nasoya, I hope I'm not too late! Had a terrible first experience with tofu, but I'm slowly learning to like tofu! I love their fortified tofu, use it pretty often. My favorite Dreena tofu recipe is the cashew-ginger tofu from EDBV (I add a little Sriracha to the sauce to give it extra kick). I haven't seen this yet. Sounds great! My new favorite tofu use- Pies! I made a pie the other day and the filling was Nasoya tofu, strawberries, blackberries and lemon (food processor'd)- All the non vegans at the party I served it to were SHOCKED when they found out tofu was the main ingredient! Yay tofu, I love you! oh YUM! Would love to win and try it! What a great giveaway, thank you so much!